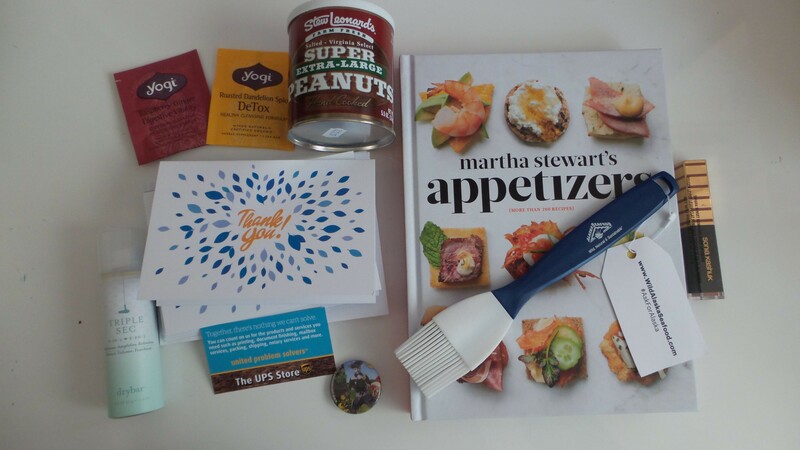 Ever wonder what Martha Stewart would give away in her gift bags? 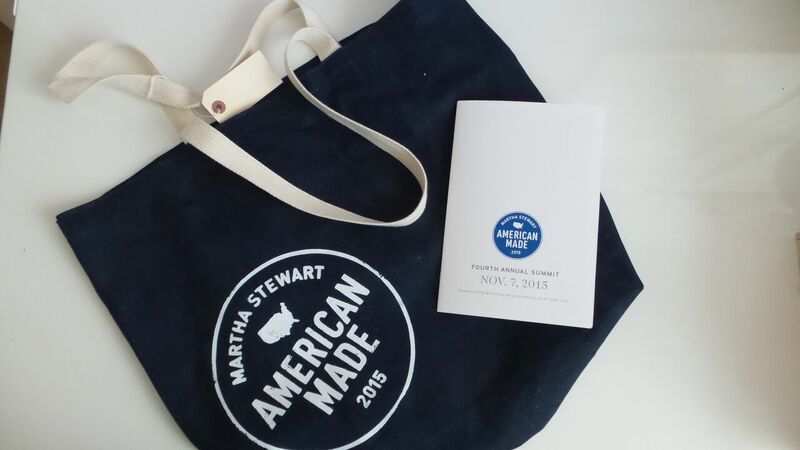 Well, here’s a look inside what we received during the American Made 2015 Summit. This denim tote from Map Tote is the perfect tote bag. It’s nice, big and sturdy with long straps. I also love the denim material used to make the bag. It was strong enough to hold all of the stuff Martha sent us home with. On the way home, I thought I spilled some of the Martha Stewart bottled coffee I had put in my bag. I kept looking for a wet spot on the bag and couldn’t find anything. After I got a couple of blocks from Martha’s HQ, I felt like I needed to eat something, because I felt like I may have had five too many cups of coffee. But wait, I only had two cups of coffee and my last cup was at 11AM. What gives? 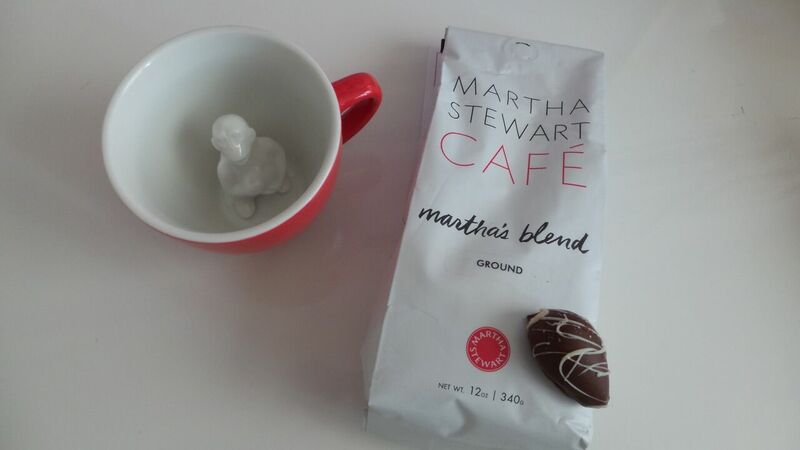 Well, it would be the aroma from Martha Stewart Cafe’s Martha’s Blend coffee. It was so strong, my body was getting the jitters just by smelling the coffee. Considering I was loving her delicious coffee at her HQ, you can expect this to be the perfect brew. You can purchase her coffee and teas at Martha Stewart Cafe. 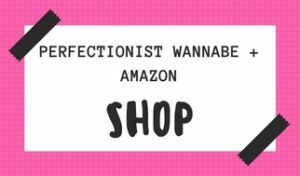 My favorite item in the bag is something I’ve been wanting for some time now, but didn’t know where to get it. This little monkey comes from a company called Creature Cups. I’m going to have to order a few more of these. I’ve been wanting the octopus one for some time. They are so cool. I can’t wait to give them as gifts this year. The little slab of chocolate (I’m going with a guess here) may be from Dylan’s Candy Bar. Let me tell you something, that little piece of chocolate had me in heaven. It was so delicious. Yogi teas, Stew Leonard’s Super Peanuts, Thank You cards from The UPS Store, Triple Sec from The DryBar, Martha Stewart’s Appetizers: 200 Recipes for Dips, Spreads, Snacks, Small Plates, and Other Delicious Hors d’Oeuvres, Plus 30 Cocktails , Seafood Brush from Wild Alaska Seafood, and lipstick from Sonia Kashuk. 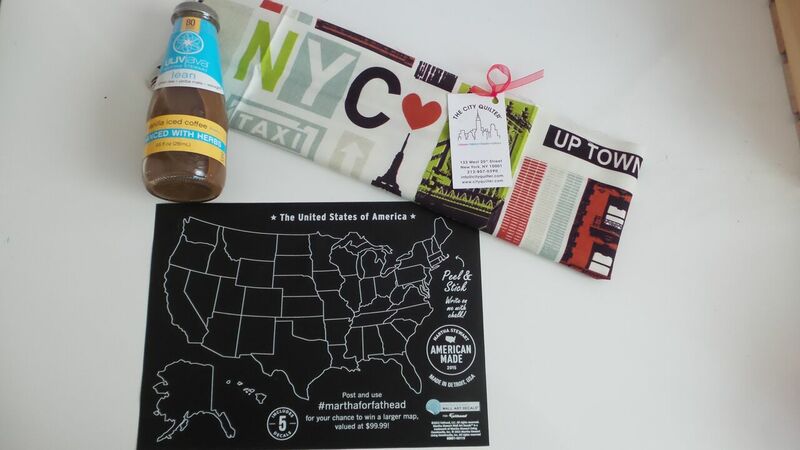 Bottled coffee from Martha Stewart, quilting material from The City Quilter, Chalkboard US Map from Fathead. What I like about the Fathead is that you can color in all of the states you’ve visited. That’s what I did with mine. This beautiful deck of cards comes from Yaniv. 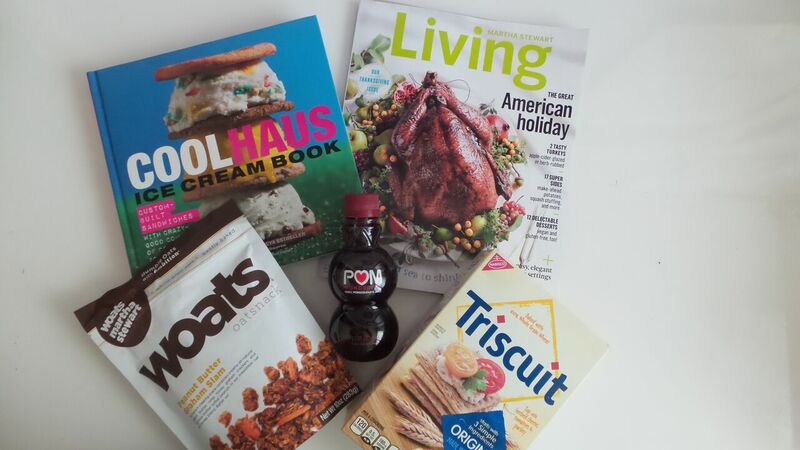 Other fun things received is the Coolhaus Ice Cream Book: Custom-Built Sandwiches with Crazy-Good Combos of Cookies, Ice Creams, Gelatos, and Sorbets , a copy of Martha Stewart Living’s Thanksgiving issue, Woats, Pom juice and a box of Triscuits. So you know sharing all of this would lead to something. 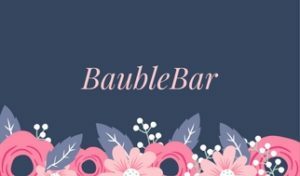 As part of the month of November, a time when we should be thinking of the things we are grateful for, Ariana Huffington mentioned that every night before going to bed, her daughter lists three things she is grateful for and shares it with a couple of her friends. Keeping in line with the things learned at the American Made 2015 Summit, I want to know what THREE THINGS you are grateful for. Share in the comments below and enter for your chance to win a copy of Martha Stewart’s Appetizers cookbook. 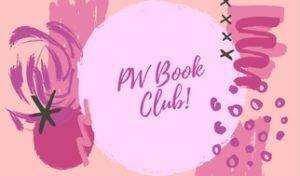 The contest begins on November 11 and ends on November 18. GOOD LUCK!